Anyone who knows me knows that chocolate is the food love of my life, my desert island food (or, should I say dessert island!). I typically prefer to eat my chocolate calories, rather than drink them; yet good chocolate is good chocolate, no matter the form. I was raised on my mother’s homemade, stovetop cocoa or my own made with Hershey’s syrup, but as an adult, my tastes matured. I was one of the few who appreciated Starbucks’ short-lived Chantico in its unAmerican tiny cups (sidebar: does anyone remember Chantico?!). 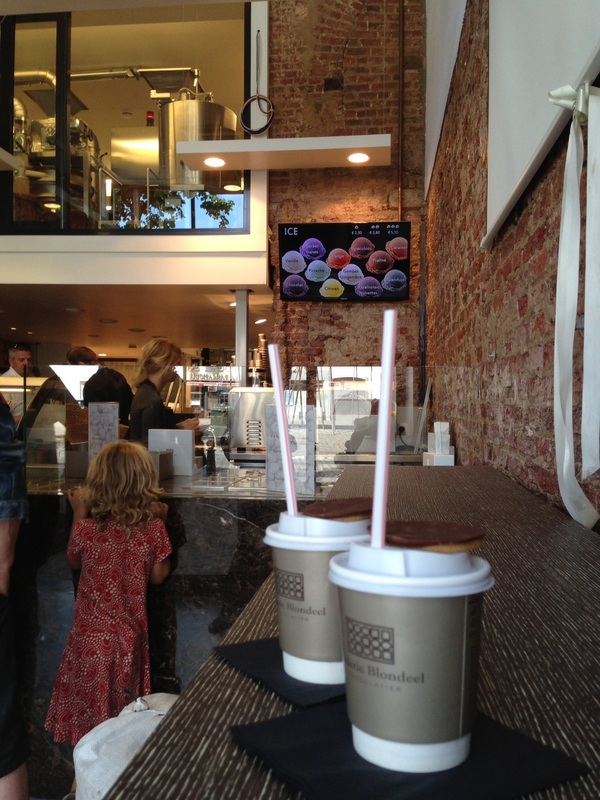 In Belgium awhile back, I discovered what was at the time the best hot chocolate I’d ever tasted, at Frederic Blondeel in Brussels. With two stores – one sit-down salon de the et chocolat (tea and chocolate) and one take-away chocolate, beverage, and ice cream (glace) retail shop two doors down at the Place de Saint Catherine – Blondeel is clearly a Brussels institution, frequented by tourists and locals alike. I don’t know what ingredient or if it’s simply the high quality and intensity of flavors, but it is pure ecstasy: rich, dark, thick, and intense while also frothy and subtly sweet. On my first visit a few years ago, I chose what I still believe to be the best variety – Madagascar vanilla. They also offer delicious Mexican, Peruvian (pure), and miel (honey) flavors, but to me, nothing tops the vanilla. I actually chewed on a piece of vanilla bean in my final sip during my most recent visit there. Strangely, afterwards, I didn’t feel weighed down at all. That is the mark of a true existential experience with your chocolate! Though they no longer serve their chocolat chaud with their signature chocolate-dipped shortbread (as pictured below), the small orange and toffee accented piece of chocolate was dark, decadent, and small enough for me not to feel like a glutton. It was bittersweet, intense, thick and yet frothy. Blondeel’s certainly is tough to top. And yet I found a valiant challenger in Tallinn, Estonia of all places. Estonians and their Baltic neighbors love their chocolate (more on this subject later). Tucked away in an artists’ alley with boutique textile and wood shops – also worth a visit! – is Chocolats du Pierre, a French chocolatier. Its retro bohemian decor and atmosphere pay homage to the Belle Epoque, reminding me of the tone of Woody Allen’s 2011 film “Midnight in Paris” with rich tones of red and gold, Tiffany lamps, and other cozy touches. Their chocolates and pastries are out of this world, but my crown jewel was their hot chocolate spiked with 4 cL of Vana Tallinn licquer. Homemade chocolate sauce laces the clear glasses, and the hot chocolate itself, while not quite as intense as a few of its Belgian cousins’ renditions, certainly packs a chocolate punch. It was so good that I revisited three more times during my stay in Tallinn. In Lithuania, I sampled a sipping chocolate that was a bit too much even for a chocoholic like me. 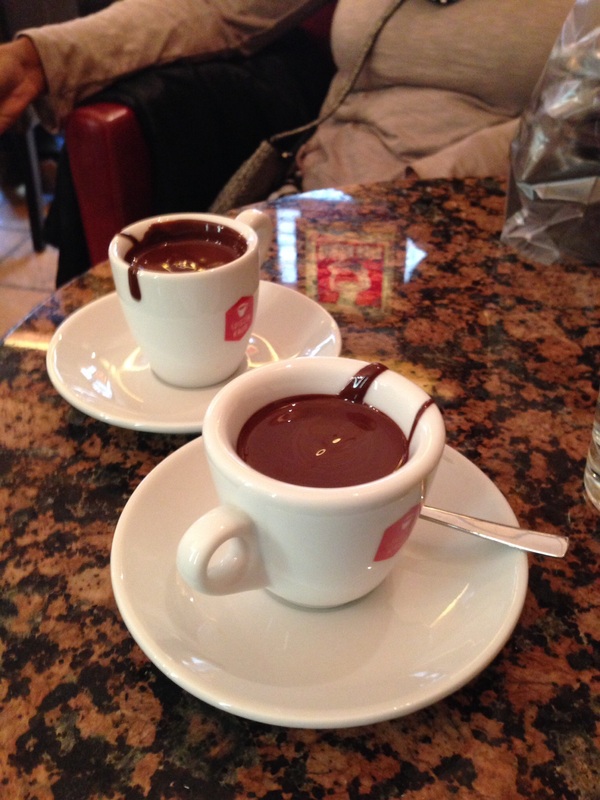 It basically tasted like drinking thicker, sweeter chocolate fondue – proof that drinking pure chocolate is unpalatable, and good hot chocolate is an art. Drinkable semisweet chocolate – akin to fondue – at AJ Sokoladas in Vilnius. There may not bee such a thing as too much chocolate, but this was just too syrupy sweet for my tastes. 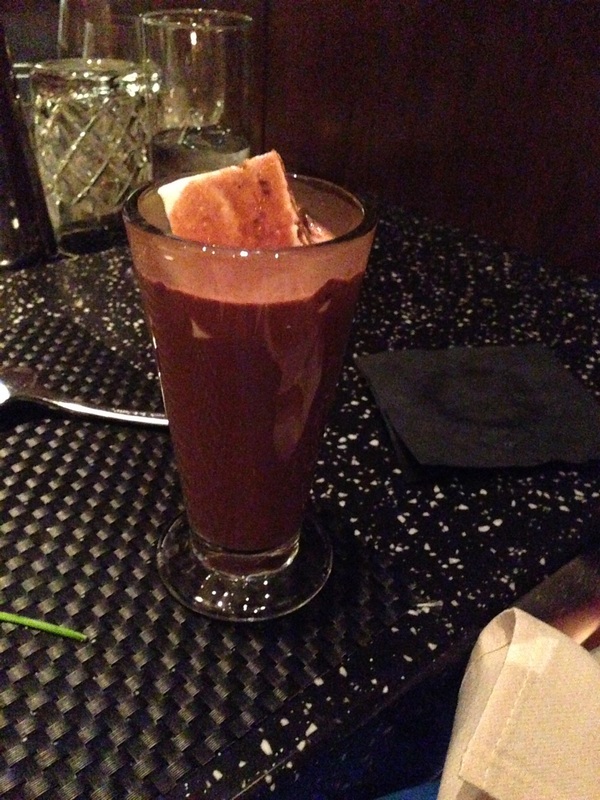 In Washington, D.C., upscale Italian osteria Bibiana served up a 2014 holiday exclusive chili hot chocolate, spiked with brandy and topped with a homemade, lime-infused marshmallow. Bartenders steep chilies into the spiked chocolate base for a week, producing a thick, powerful punch of chocolate and spice. Washington, D.C.’s Bibiana Osteria offered a December-only, amazing chili and brandy-spiked hot chocolate with a homemade marshmallow. A valid challenger! So which chocolate challenger wins the world title? Each of them was unique and worthy, and since I have not tried hot chocolate everywhere -yet! – I simply can’t make that call. So you decide! Share your favorite hot chocolate with The CD community. All of these chocolate adventures inspired me to make a DIY version at home. While I wasn’t trying to match the decadence or creativity of the shop or restaurant-made versions, I wanted a base for a good spiking or flavor variation. In my next two posts, I’ll share recipes for both a devilishly rich variant and a more angelic, diet-friendly version. Check it out soon! Previous Post It’s Chocolate Month at The Culinary Diplomat!